An adult reader of David Covell’s impressionist tone poem of a picture book Run Wild might initially conjure up the British Best Picture winner Chariots of Fire, which features two Olympic runners who earn gold medals for their country in track. One of them, an English Jew runs to overcome prejudice, the other a Scottish missionary runs for the glory of God. A fleeting recollection, but one in the spirit of a children’s book reveling in the most sensory of human activity. 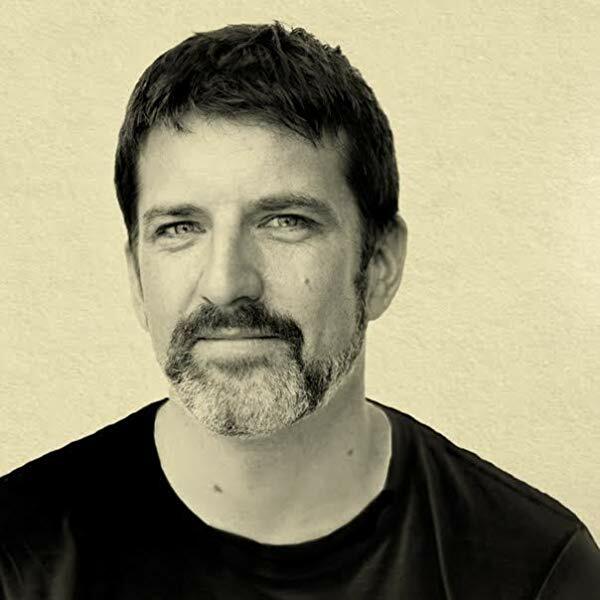 The book’s creator of course isn’t looking at race, religion or underlying motives, he is in fact stripping rhyme or reason from this equation to document what a child would see, hear and feel during an outdoor marathon that will bring geographically connection to various terrains, geological obstacles and the elements. Covell’s propositions would be daunting even to the most fleet-footed of youthful runners, much less the modest achievers featured in a all-encompassing rendez vous with Mother Nature. Named one of the Ten Best Picture Books of 2018 in late November by the prestigious New York Times committee Run Wild is a watercolor tour de force, in fact it’s bleeding images almost seem overly saturated, whether exhibiting rabbit ears drawn in thick brush strokes like something you’d see in an Elementary School art class or cotton candy grey clouds and captions his free-spirited jaunts with handwritten printed text to underscore that running is a bohemian endeavor that should never be comprised by time, extent or restrictions. At the outset Covell urges a young male to vacate his home: Hey, You. Sky’s blue! (forget your shoes) OPEN that door and…. Sprouting from the door’s keyhole is a stem and sunflower and through the window a girl is running, overseen by a bird. The author-poet banners the ensuing double-page spread, Sprout, you’re out! 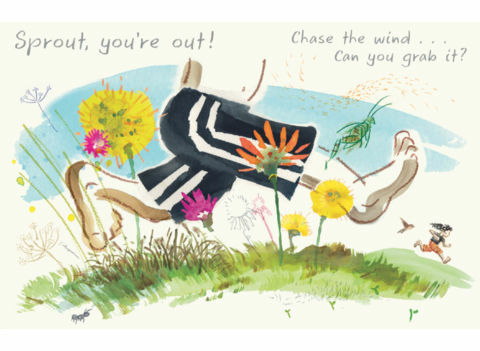 Chase the wind…Can you grab it?, and urges sensory immersion that could reverse the rules of nature. Grass, flowers, insects and two legs well underway chronicle this once-reluctant couch potato’s prompt enlightenment, much as a once stuffy and rules-abiding tiger did in the liberating Mr. Tiger Goes Wild by Peter Brown. Covell proposes some near-impossible feats even for the fleet-footed but better try than accept defeat. Go ahead….Race a rabbit! Crunch. Crack. Twig. SNAP! No mind that a rabbit’s strong legs were made for running, or that they can reach speeds of 25 to 45 miles per hour, which would challenge a car much less a person. Yet sprinting with abandon suggests Covell could confound the pundits. The watercolor depiction of blurred images perfectly envision speed, which for the runner is a blur of sorts. In Squeaky clean? Who cares about that? the author urges disregard for cleanliness, as the more direct engagement with the elements the fuller the experience. Like Tom Sawyer and Huck Finn these two around worried about diving into mud patches, where as Covell notes they’ll find some unexpected visitors: Squish, Squirm, Fiddlehead. Fern. Meet a beetle. Talk to worms. The outline of a foot, where a worm is wrapped around the toes and a beetle finds a temporary perch on one is seen in close-up in a very brief recess from the run. Run Wild’s joggers must keep the pace, unlike the two adults in Richard Connell’s short story “The Most Dangerous Game” who aren’t allowed a brief respite if they hope to stay alive. And Covell suggests that unrestrained running will even win approval from above: Run. Run. Wild. Wild. All day long, the sun’s gonna smile. That seemingly cognizant source of our energy is pictured as a round as a round multi-layered circle in the sky behind a wooded clearing, where the boy briefly recesses after pondering the next cue, a natural continuation of this outdoor adventure, but one with corresponding annotation: Are you brave? Come on, explore, and what we see is a dense and darker refuge that might have adults hearing Longfellow: This is the forest primeval. The murmuring pines and hemlocks, Bearded with moss, and in garments green, indistinct in the twilight. The boy briefly apes a lion Grr, Grr, Grizzly, ROAR, before again taking up this fleet-footed mission. Faster, feet! On to the shore. and that familiar profile with arms stretched and legs far apart drive the runner forward to a scorching terrain: Hot! HOT! Burning sand., and this undaunted purveyor of the outside world’s infinite variety tip toes through burning sand grains that likely feel like needles piercing his skin. On to some quick relief afforded by the seashore Ahhhh…Cool. Hello, Clam. and the soft turquoise relief of the shore and the clams. Again Covell applies the foot outline to accentuate the drastic change in temperature. In one of the artist’s best tapestries in the book the boy is advised to Be a fish in the salty sea. after he takes a deep breath and counts to three. The green-blue grainy mass with undisciplined seaweed and a starfish herald in the ocean where the young boy is now only too willing to access. But of course no person can remain under the water much longer than two minutes so the author gives the order: Now, UP for air! 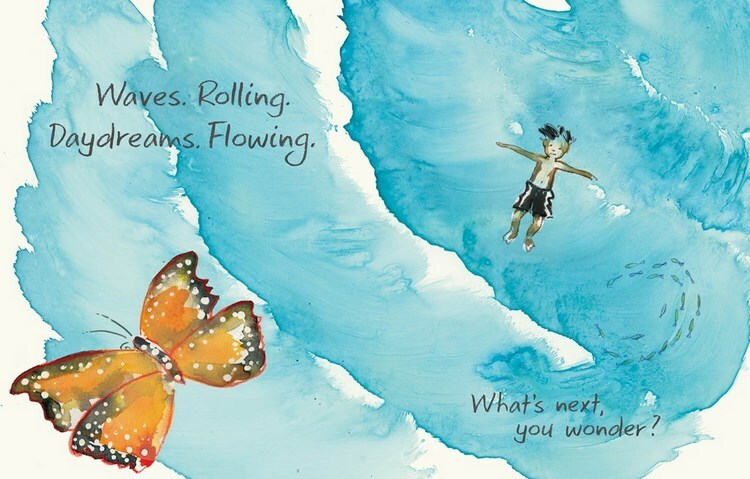 Just float there…and the boy’s outlined feet are pointed upward, where a butterfly investigates. Another rapturous tapestry, Waves. Rolling. Daydreams. Flowing; What’s next, you wonder? and this youth seems is quickly attuned to water and how to float on it.. Then a canopy of darkness and a corresponding aural bombast, Crash! Boom! Thunder! summons this bodacious marathoner to stay the course: Run! Run! Wild Wild. Some days the sun WON’T smile. Soggy negotiation of the ground when it’s raining cats and dogs does come with a price though as the author documents, as slippery “slumps” means “bruises” and “bumps” and “ROTTEN STUMPS” will lead send the runner into free fall. An “ugh” and a “slug” signal exasperation and the appearance of that slithery tough-skinned terrestrial mollusk, an unwelcome visitor in any season. Covell presents this suspended encounter in stark minimalism. Then, this fallen but still determined adherent of outdoor anarchy is approached by his running colleague, previously of the invisible variety. She asks him if he is all right and he answers in the affirmative. With an airborne cheerleader over her shoulder she coaxes on this temporarily derailed denizen of the outdoors to again take up the cause and the artist responds with a glorious yellow-tinged canvas, a watercolor tour de force, Breeze. Blowing. Sunset. Glowing. showcasing these two intrepid track stars and their wildlife supporters running through the dusk and then under the celebratory nocturnal marker negotiated white on black, Ah-Wooooooooooo! Moon’s gonna smile. Run. Run. Wild. Wild. these two astoundingly resilient marathoners add lunar approval to their miraculous exploits. The final end papers depict the two running through a wooded hamlet during a snow fall, and this devil may care story of fleet footed exuberance would surely win the heavenly approval of Jesse Owens. Sharp readers will take note that the opening end papers pictured only the girl in an autumnal sprint, before the boy realized that only outdoor absorption can accomplish what Emerson promoted in his famed transcendental essays. 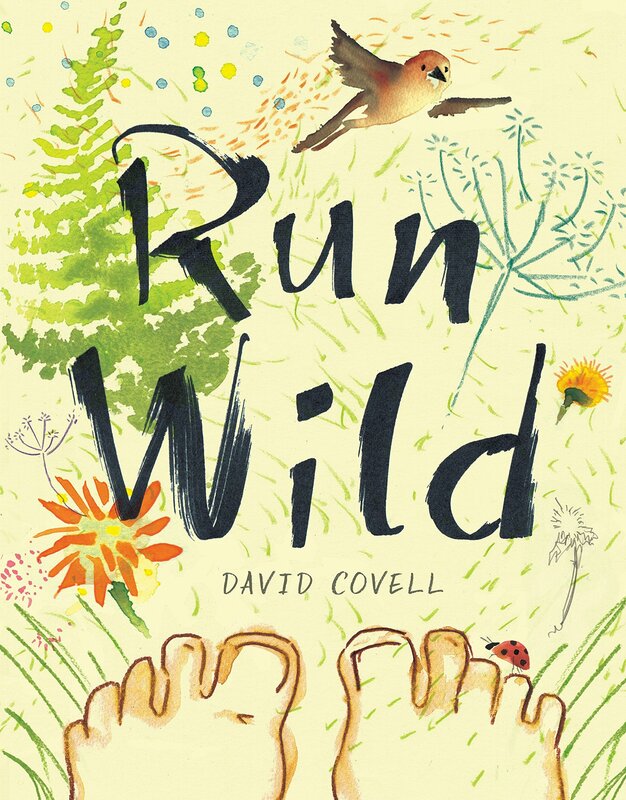 Run Wild is as close as a picture book can achieve in making readers feels and sense the unbridled running experience and rarely has watercolor been employed so compellingly and yet so sublimely to document this connection. As of this writing the Caldecott committee are still more than a full day from convening to make their selections for the books they will honor for 2018. It would hard to fathom this rapturous free-spirited tone poem won’t be under serious scrutiny. Note: This is the twenty-fifth entry in the 2018 Caldecott Medal Contender series. The annual venture does not purport to predict what the committee will choose, rather it attempts to gauge what the writer feels should be in the running. In most instances the books that are featured in the series have been touted as contenders in various online round-ups, but for the ones that are not, the inclusions are a humble plea to the committee for consideration. It is anticipated the series will include in the neighborhood of around 25 titles; the order which they are being presented in is arbitrary, as every book in this series is a contender. Some of my top favorites of the lot will be done near the end. The awards will be announced in late January, hence the reviews will continue until around the middle of that month. Sam — You’ve done it again. Another fantastic review! 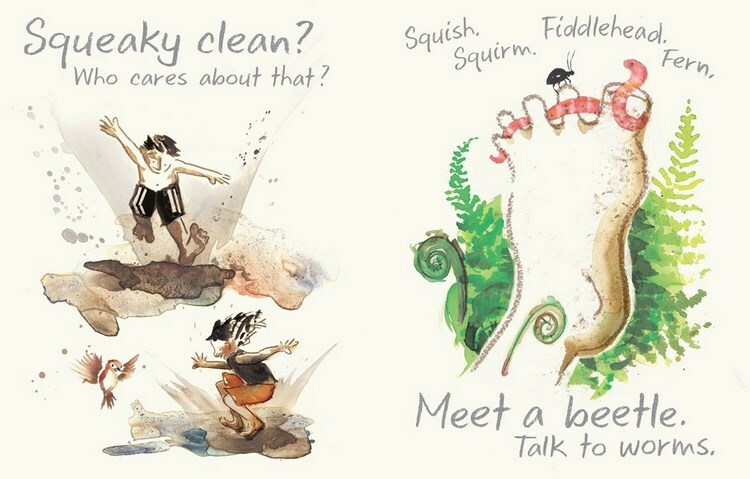 I especially appreciate the watercolor illustrations in author-artist David Covell’s fast-footed book, RUN WILD. And the contrasts are fun. From “Hot! Hot! 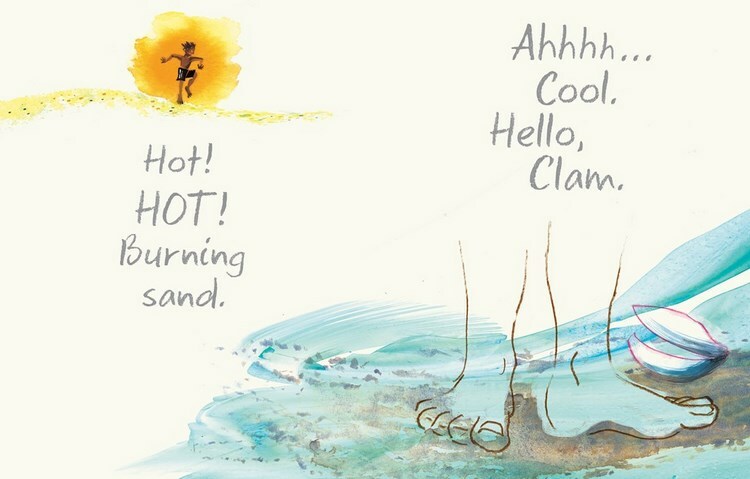 burning sand,” to “Ahhhh… Cool. Hello, clam.” And from (not!) Squeaky Clean to weaving toe-weaving worms! I haven’t seen this book up front yet, but I love what I see in the page shots and your writing is again top-drawer and fascinating. btw I am also a longtime fan of Chariots of Fire and love the way you used it as a lead-in for a book with this subject!